The aesthetic qualities of a good Jones silver stain are underrated. The black linear pattern contrasting against the colors of the counterstained tissue evokes the lead borders and colored glass of stained-glass windows. But aside from their beauty, silver stains are very useful for detecting abnormalities affecting the basement membranes. A previous PathPointer highlighted the spikes visible in membranous nephropathy; this PathPointer will feature another familiar finding: double contours, or tram tracks. 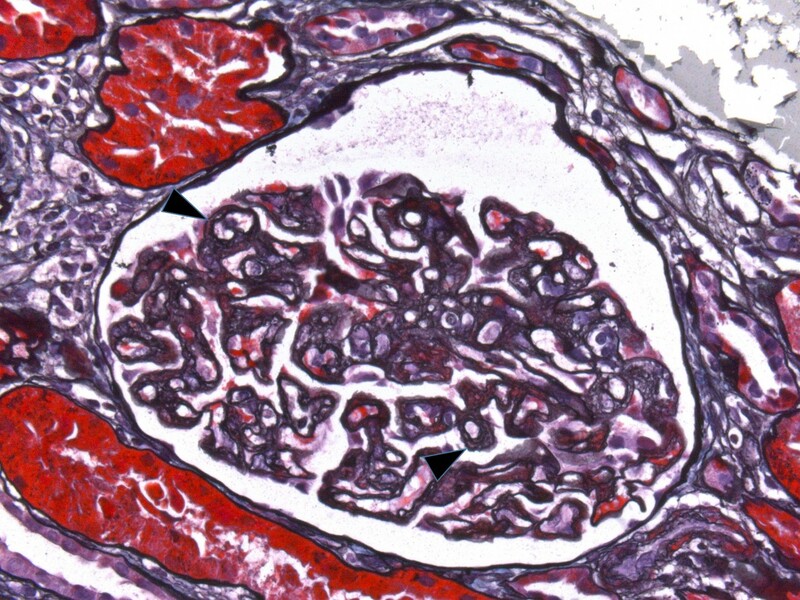 The normal glomerular basement membrane appears as a single black line on a Jones stain. When a second line appears to track along the inside of the capillary wall, it gives the appearance of a double line, double contour, or tram track (black arrows in Figure 1). 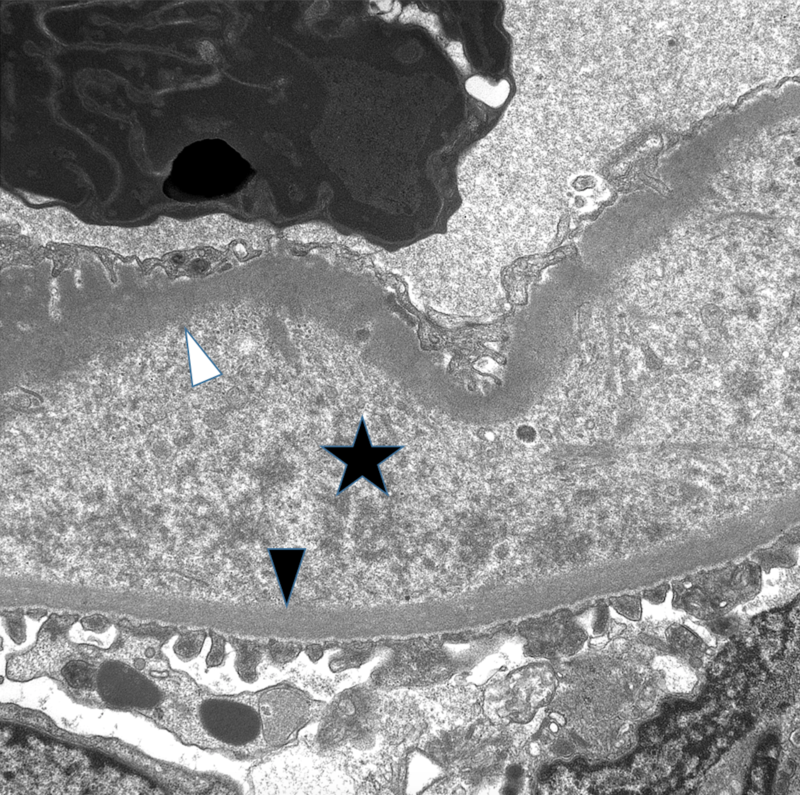 This finding indicates chronic endothelial injury that has resulted in deposition of a layer of basement membrane-like material just underneath the endothelium. The images in this PathPointer show a biopsy performed on a patient 5 years after renal allograft who presented with rising creatinine, proteinuria, and negative DSA. Light microscopy showed segmental double contours. Immunofluorescence was negative, including negative C4d. Electron microscopy confirmed the presence of basement membrane duplication with a fluffy intervening space and no immune complex deposits. This combination of findings indicates chronic endothelial injury which may represent “transplant glomerulopathy” (often attributed to chronic active antibody-mediated rejection), or a microangiopathic process (such as drug toxicity or complementopathy). The latter would be supported by other features of thrombotic microangiopathy (TMA) such as microthrombi or mesangiolysis, but generally the above lesions may appear very similar, highlighting their common pathophysiologic mechanism of chronic endothelial injury. This patient is favored to have a systemic TMA; complement pathway testing is underway. Check out our collection of PathPointers at AJKDBlog.org.